JUNO BEACH, Fla., April 3, 2018 /PRNewswire/ -- Florida Power & Light Company (FPL) today announced the homecoming of more than 120 company lineworkers, management and support staff following a three-month mutual assistance deployment to Puerto Rico in the aftermath of Hurricanes Maria and Irma. Florida Gov. 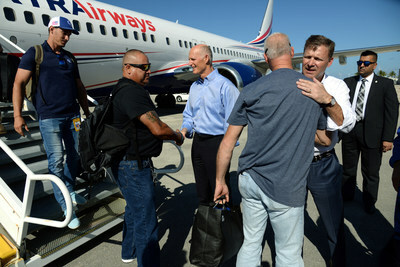 Rick Scott, who first led a delegation of Florida energy companies to Puerto Rico in November 2017, joined FPL President and CEO Eric Silagy to personally thank the company's employees after their flight arrived at Palm Beach International Airport. "Words cannot describe the pride we at FPL have for our dedicated employees who volunteered to leave their families for weeks, and in some cases months, with one goal in mind – to get the lights back on for our neighbors in Puerto Rico," said Silagy. "What has stuck with all of us is the warmth and graciousness of those in the Commonwealth who were without electricity for so long. Despite their own very real challenges, they welcomed us into their homes from day one. Their resiliency and positive spirit fueled our employees during long, strenuous work days, so much so that it inspired our teams to often give back once their 16-hour workday was complete. This mission was about more than simply restoring electric service. This was about helping our fellow Americans in their greatest time of need." "I was glad to welcome utility restoration workers home today from their work in restoring power in Puerto Rico," said Gov. Scott. "During one of my four trips to the island since Maria made landfall, I led a delegation of Florida utility providers and national emergency experts to help Puerto Rico's recovery. I'm proud of the work that we have done in Florida to help our neighbors in Puerto Rico recover." In late December 2017, FPL began to transport vehicles and electric equipment via barges to the Commonwealth from the Port of Fort Pierce and, in early January, began rotating teams onto the island every 30 days, with some lineworkers volunteering to remain for the entire 90-day deployment. Before returning to Florida, FPL helped restore service to 97 percent of Puerto Rican citizens in the Bayamon region, just west of San Juan. FPL line crews worked 30 days on, one day off, in concert with a 10-person Incident Management Team (IMT) tasked with overseeing the restoration in one of seven regions on the island. The Puerto Rico Electric Power Authority (PREPA) will now assume complete responsibility for restoring power to all remaining customers. With so many FPL customers and employees having strong ties to Puerto Rico, the company felt a unique responsibility to help get the lights back on for the millions who lost power last fall. FPL's support of power restoration in Puerto Rico began after the company completed its own restoration in the aftermath of Hurricane Irma. In the days immediately following Hurricane Maria, NextEra Energy, FPL's parent company, donated $100,000 and matched the same amount from employee donations to help those affected by the storm. Many employees also held fundraisers and supply drives to assist those impacted. Additionally, FPL and its employees are working with local officials in Bayamon to rebuild and repair a playground and basketball court that is located next to where FPL crews established a base camp.